Regenerative medicine employing muscle or adipose derived stem cell (ADSC, MDSC) therapy may be a promising approach in this bothersome condition, but its clinical use is not yet established due to safety and efficacy terms. These treatments are invasive, relatively expensive and it is not known to which extent these cells become functional in the target tissues. 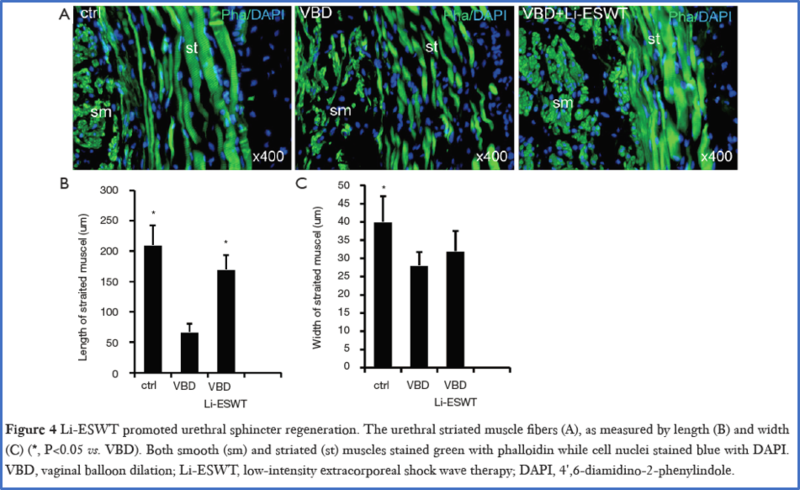 Alternatively, low-intensity extracorporeal shock wave therapy (ESWT) has been shown to promote tissue angiogenesis as well as musculoskeletal- and neuroregeneration. An effect attributed to the ability of ESWT to activate the migration, proliferation and differentation of local mesenchymal stem cells (MSCs). Scientists of the group of MD T. Lue, an internationally renowed expert in the field of experimental urology (San Francisco, CA, USA), now vividly demonstrated that Spark Wave Therapy ameliorates stress urinary incontinence in a rat model: female rats were divided into 3 groups: 1. Control no treatment, 2. Vaginal ballon dilation (VBD) catheter, which represents trauma during birth, and 3. VBD with subsequent Spark Wave treatment (2 x per week for 3 weeks, 0.03 mJ / mm2, 200 shocks). Leak-point pressure (LPP) for functional analysis was measured and urethras were harvested for histological analysis. Angiogenesis was detected via vascular endothelial growth factor (VEGF) expression and EdU labeling allowed tracking of progenitor (stem) cells in the tissue. Spark Wave Therapy improves urethral leak-point pressure (LPP). Spark Wave Therapy significantly increases the amount of endogenous progenitor cells in the urethral muscle layer. Spark Wave Therapy significantly increases urethral angiogenesis by promoting VEGF expression. Spark Wave Therapy evokes urethral sphincter muscle regeneration in vivo. This high-quality, state of the art fundamental research study showed that Spark Wave Therapy restores vascular integrity and promotes neuromuscular tissue regeneration. It represents a safe and effective treatment for various trauma-associated disorders, including stress urinary incontince related to birth trauma.Spark Wave Therapy recently becomes a valuable and highly emergent technology in the field of regenerative medicine and represents an economic and non-invasive technique to mobilise endogenous stem cells. Wu AK, Zhang X, Wang J, Ning H, Zaid U, Villalta JD, Wang G, Banie L, Lin G, Lue TF (2018). Treatment of stress urinary incontinence with low-intensity extracorporeal shock wave therapy in a vaginal balloon dilation induced rat model. Transl Androl Urol. 2018 Mar;7(Suppl 1):S7-S16.